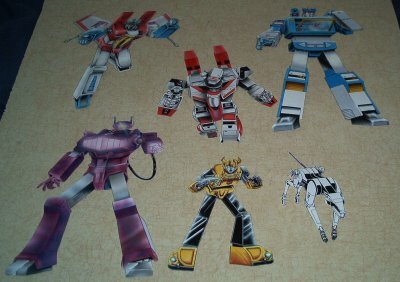 Alright, here's a selection of the smaller cutouts. I've got far more than these, but I just put up a few of the ones that I'm not embarrassed about. These cutouts range in size from 2 to 4 inches tall. You'll also notice a wide variety of characters looking as the looked in the mid-to-late 90's. 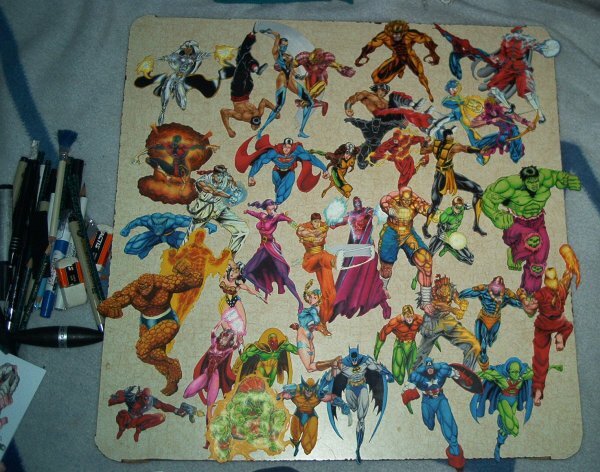 Not only are there comic characters, but video game characters from games like Street Fighter, Mortal Kombat and just one Tekken character. The Iron Man and Beast cutouts were later scanned in, modified a bit by computer, and put on crappy backgrounds here and here. Out of all the small cutouts that I've made, Hawkeye is the crown jewel. Why? Well, for one thing, the actual drawing came out pretty good. Then, I did a decent job of coloring it. But the real reason that I like it so much is because I actually cut around the bowstring that I drew without breaking the paper. 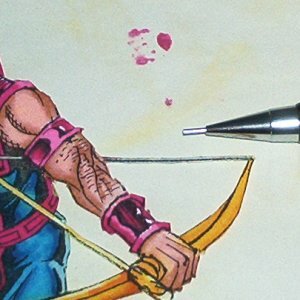 Here's a close-up of Hawkeye next to a mechanical pencil. This is to show the scale I was working with. I was going to make some cutouts of Soundwave cassettes that could fit inside the chest. To make sure that SW was ready for this, I cut the cassette door frame and a Decepticon symbol off a second copy of the picture and colored them. I also cut out a piece of transparent acetate film in the shape of the door with a flap at the bottom. I pasted the frame onto the acetate film. 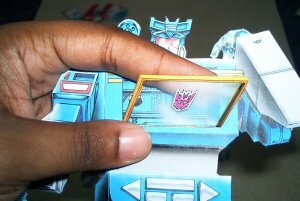 I took the main Soundwave cutout that I colored and used an Xacto knife to cut a hole at the bottom of the doorframe just wide enough to slide the acetate film's flap through. I slid it in, aligned it all just right and glued it on the back. As the final touch, I glued the second Decepticon logo onto the front. All that work for something that I never ended up doing. Still, it was fun to do... in a weird artist kind of way, that is. All of the characters on this page are property of their respective owners.